I’ve read many books that attempt to chronicle the history of video games. But even with cold, hard facts and a decent knowledge of their roots, it’s difficult to pinpoint when video games evolved into something you can characterize as “interactive stories.” What’s in a story, after all? The video games of the late 1980s had stories that you could make immersive if you had a vivid enough imagination. That (rather large, meaty and metaphysical) question aside—I think we can all agree that video games (as an art form) are, in essence, a telling of the world. Whether “the world” is a real or imaginary place depends upon the game (and probably the genre). But…most games exist behind a wall. The player controls the world from behind the wall. And, no matter how vast that world really is, it rarely “breaks down the fourth wall” in order to directly interact with the player. Tearaway plays by an entirely different set of rules. There are franchises like Metal Gear Solid that toy with the fourth wall in order to drive emotions and thoughts from the player, but…Tearaway outright dismisses the fourth wall from the start. If you’ve never played the game before, but still find yourself reading this—picture a premise similar to Bastion from Supergiant Games. Iota’s story doesn’t unfold as he walks forward, but you are left with the distinct impression that omniscient, snarky narrators are kind of making up this story as they go along. I’ve stated as much in my review of the game, but, by the time it was all over, I was inspired to say so much more. Helping you feel at ease, right from the start. What better point to start off this analysis than the very beginning? Within the first two minutes of starting a new game, you’re greeted in a way that few games utilize—the game actually greets you. Folks you’ve never met exclaim, “They turned it on!” Indeed, you turned on the Vita and started playing Tearaway. What is it? It’s a You! What is that?? Let’s find out! A simple tap on the touch screen, and the game opens up to reveal…who you are. And this is where things start getting personal. Is your first reaction to shy away from yourself because the Vita’s camera has pictured you in an unflattering light? Are you impressed with the technology, especially given the route this game is about to make? The narrators explain, “This is a world of stories. [But we’ve heard them a thousand times before. This story needs something different…it needs you. ]” And, as soon as “you” comes out of her lips, you’re greeted once again by your own lovely face. This game relies completely upon you, the player, so it has to go out of its way to accommodate you, to make you feel comfortable, feel like becoming a part of this world is something you want to do. There are various accommodating methods that Tearaway utilizes, and one of them caught my eye right from the start. Would you prefer to be addressed as male or female? We’ve come a long way from the days of Pokémon asking if you’re a boy or a girl. Asking how you’d “prefer to be addressed” seems like a tiny, insignificant detail in the long run. But when you consider that Media Molecule is trying to reach out to a wide audience of gamers who come from an infinite number of backgrounds, who (especially in the modern era) may take the tiniest details to heart—this is to Tearaway’s credit in creating as comfortable an environment as possible. After that, you shake things up—temporarily merge your world with the one being created in the game—and are given a glimpse of a message from their world to yours. The story of Tearaway is the story of Iota/Atoi: the message that you give form, ultimately the hero(ine) of the story. For the sake of being specific to my experience with/analysis of the game, I’m going to refer to that character as Iota from here on. But rest assured, the game remains the same no matter what form your message takes or how you choose to be addressed. The message of Tearaway is universal. And the many ways what I just said can be interpreted because I’m talking about Tearaway…well…it fascinates me. There are many other ways that Tearaway attempts to pull your world into theirs, and vise-versa. The best example of “vise-versa” that I can think of is the existence of Tearaway.me. While playing through the game, you’re able to take photos. If you encounter a blank object that seems to have a form, but no substance—simply take a picture of the white object and watch it come to life as soon as the camera flashes. Doing this allows you to collect paper-craft—which goes beyond adding completion points to your save file, and is actually used to upload instructions to create paper-craft Tearaway characters yourself, so they can actually become a part of your world. Tearaway.me isn’t just a place to view these instructions—it’s where the community of Tearaway can come together to share any photos they’ve taken from the game, and in general…do things like celebrate this past Friday by bouncing, etc. 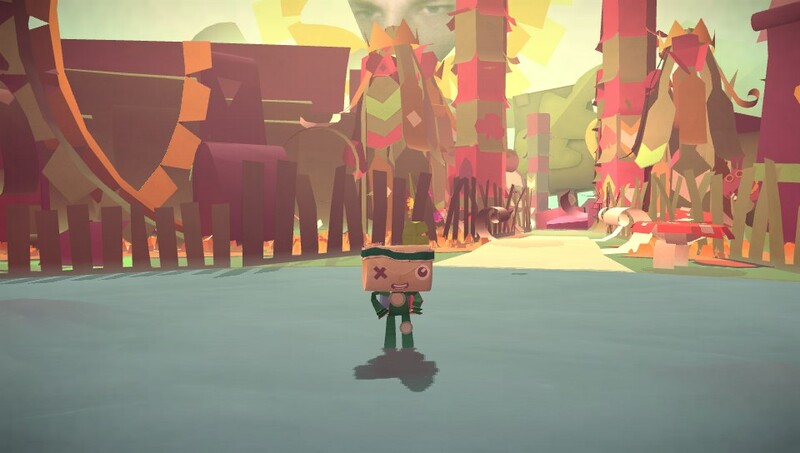 It’s a single-player, multilayered game that encourages you to bring their world into your own and fosters a unique sense of community, all through Tearaway.me. I think that goes a step beyond games that rely on one’s own creativity like Scribblenauts. It’s something that Tearaway does exceptionally well, and only adds to what I’ve been saying about going above and beyond in order to make the player feel comfortable. Still, I can’t just lay this analysis to rest by going on about the relationship between Iota and (the) You. I’m going to discuss plot from this point forward, which will lead to SPOILERS. This is the kind of game whose twists and turns are genuine, and will leave you with a bigger sense of appreciation if you experience them first-hand. You’ve been warned. Previous Post:Do You Have What It Takes to Work for oprainfall?